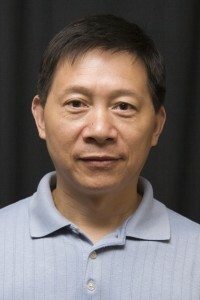 A senior lecturer of informatics, Louie (Liugen) Zhu regularly teaches several core courses in the Informatics Bachelor of Science program. He’s a big believer in active learning, and has extensively integrated innovative technologies in his teaching to promote student participation and foster learning. The sign-in application he’s developed, integrated in IU’s Canvas course management system, allows students to sign in electronically and to view attendance records at any time. Zhu received the Indiana University Trustees’ Teaching Award for his positive impact on learning through the direct teaching of students and a sustained level of teaching excellence. As an IU Mosaic Initiative Senior Fellow, he’s focused on using advanced learning technologies to implement team-based, collaborative learning to engage students. The LiFT Scholars Leadership Team. Through the LiFT (Leading Informatics for Tomorrow) program, this research is focused on efforts to encourage academically talented, economically disadvantaged, and underrepresented minority high school graduates to excel in the field of IT. Empowering Informatics Diversity Enhanced Workforce research project. This STEM project, which received a $4 million National Science Foundation grant, seeks to increase the quality and quantity of information technology professionals. Zhu earned his doctorate from the University of Illinois. Before joining IUPUI in 2009, he was an associate professor at Vincennes University, teaching information technology courses.